Don's Notepad (Official): A historical and theological examination of Christmas as a tradition: is it pagan or Christian? A historical and theological examination of Christmas as a tradition: is it pagan or Christian? SHOULD CHRISTIANS NOT CELEBRATE CHRISTMAS BECAUSE IT'S OF PAGAN ORIGIN OR SHOULD THEY CELEBRATE IT BECAUSE IT IS OF CHRISTIAN ORIGIN THAT CELEBRATES THE BIRTH OF CHRIST? Was the Christmas date December 25 copied from the pagans and therefore Christmas is a pagan original? Is it true, as commonly proffered around by many Christians, that Christ was not possibly born in December because shepherds in Bethlehem could not have possibly watched their flock out in the open fields in the winter time if Christ was born in December? There are some Christians who believe that Bible-believing Christians should not celebrate Christmas because of its pagan origin. Many others insist that we should celebrate Christmas because it commemorates the incarnation or the birth of Christ. Which one is correct? The truth is, there is no primary historical evidence that the celebration of Christmas on December 25 is of pagan origin, likewise, there is no biblical mandate that we should or we should not celebrate the birth or the incarnation of Christ. Hence, any which position one holds, he cannot be dogmatic or be a fanatic about celebrating or not celebrating Christmas. If one's conscience tells him or her that he or she should or should not, it's up to him or to her, either way, he or she does not violate any biblical mandate or biblical principle. ORIGIN OF THE WORD "CHRISTMAS"
The word "Christmas" is derived from the archaic English word "Christmesse" which means "Christ's Mass." The term was coined during the Middle Ages which referred to the mass held in the middle of the night on December 25th to celebrate the birth of Christ. In Latin it is called "Natalis" or "Nativity," in German it is called "Weihnachten" which means "Holy Nights." These terminologies, however, came much later in the Middle Ages. The popularly known first recorded celebration of Christ's Incarnation or birth on December 25 was the date AD 336. But what is not known to many, is that primary patristic historical accounts predate AD 336 by almost 200 years. The celebration on the date December 25, was based on earlier patristic estimation (no exact biblical or historical data) that the Anunciation (the angel's announcement to Mary that she would conceive the Messiah) happened on March 25, hence, nine months later, that is, on December 25, must have been the birth of Christ. In other words, celebration of Christ's birth by Christians was established way before AD 336. 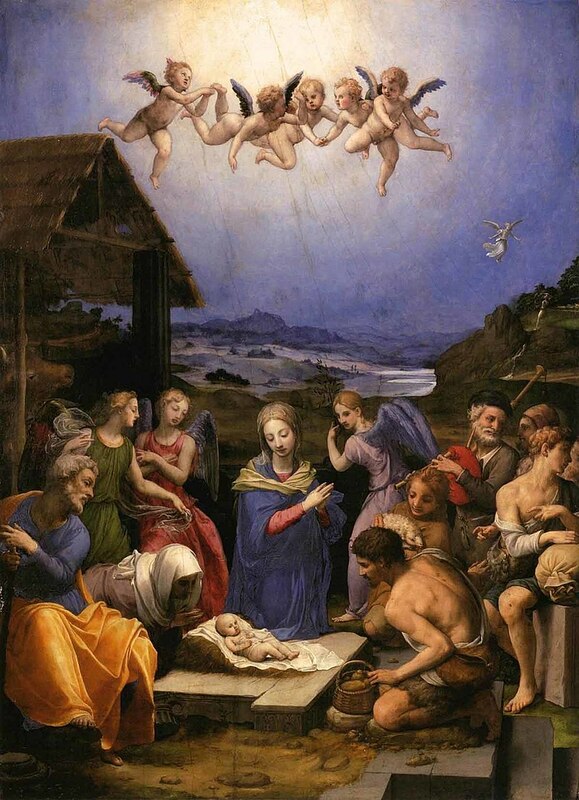 Primary historical evidence coming from patristic writings during the era when December 25 began to be celebrated as the birth of Christ shows that, in fact, the Christian celebration of the birth of Christ on December 25 was a Christian original. In his work "Chronographiai" dated in AD 221, which predates Emperor Aurelian's decree to celebrate December 25 as a pagan festival by more than half a century, the Christian traveller writer-historian, Sextus Julius Africanus, indicated that the Incarnation of Christ by way of Mary's virgin conception was on March 25 and, hence, it follows that nine months after that, it is calculated that Christ's birth was on December 25 (Iulius Africanus, Sextus. Chronographiae, AD 221, Tractate 92, Martin Wallraff, ed., Walter de Gruyter GmBH & Co. GK, Berlin, 2007, p. 274). “For the first appearance of our Lord, in the flesh, in which he was born in Bethlehem, took place eight days before the Kalends of January [December 25], on a Wednesday, while Augustus was reigning in his forty-second year, and from Adam, five thousand and five hundred years. He suffered in his thirty-third year, eight days before the Kalends of April [March 25], on a Friday, in the eighteenth year of Tiberius Caesar, while Fufius and Rubellius were Consuls” (Hippolytus, “Commentary on Daniel," IV.23.3, AD 204, translated by T.C. Schmidt from chronicon.net). We ought to celebrate the birth-day of our Lord on what day soever the 25th of December shall happen" (Magdeburgenses, Cent. 2. c. 6. Hospinian, de orign Festorum Chirstianorum). So in the Christian world, that is, during the post-apostolic catholic Christian era ("catholic" with a small "c" meaning when Christianity was universal when all post-apostolic Christian churches in the East and in the West including churches in Asia Minor were considered universally equals) before the era of centralized world dominance of the Roman Catholic Church by virtue of the decree by the pagan Roman Emperor Justinian in AD 508, December 25 was already observed by Christians for three centuries as a celebration of the birth of Christ. It was a tradition established by the patristic Christian community to commemorate the Advent of our Lord as a Man to save the world. Celebration of Christmas on December 25 by Christians was therefore a Christian original and not a pagan copycat as floated around hundreds of years later mostly by critical scholars and non-believers in the 1600s to the 1800s. The idea that Christians copied from the pagans is, therefore, falsehood, and is a myth. It is the other way around, the pagans copied from the Christians. It should be emphasized though that although the early post-apostolic Christians were the ones who originally came up with the date December 25 through their own calculations as the birth date of Christ, biblically speaking, there is no proof for it because the Bible is silent about the birth date of Christ. But was it possible that Christ was really born in December when it was winter in Israel? Luke says that shepherds were out watching their flock that night when Christ was born (Luke 2:8) which seems to suggest that Christ was born either in the spring, summer or fall. If it was really winter in Palestine when Christ was born in Bethlehem, how could shepherds be out there that night watching their flocks? Many Christians and scholars proffer the traditional belief that Christ could not possibly have been born in December because it was not possible that shepherds would be watching their flocks at night during winter time in Israel. But how true is this assumption? The truth is, winters around Jerusalem and Bethlehem (only 5 miles away from Jerusalem) could be between 45 to 59 degrees F, and if it was a mild winter it was possible that sheep were out in the fields grazing with their shepherds watching them (Kenneth Frank Doig, "New Testament Chronology," Lewiston, NY: Edwin Mellen Press, 1990, chap. 9). My family and I have been to Bethlehem a few years ago, it is now inhabited by the Palestinians separated by a great wall from Jerusalem which is only about 5 miles west of Bethlehem. The town is a hilly town. Even today, there are still sheep and shepherds in the area. Winters in Bethlehem and Jerusalem are like winters in Florida, they have mild winters with average temperatures in the mid-40s F to 50s F. So shepherds watching their flock in the winter in Bethlehem was not an impossibility. In fact even today, shepherds still watch their sheep at night in Bethlehem on Christmas eve. In the time of Jesus, during normal weather, that is, summer and fall, shepherds would graze their sheep during daytime and gather them inside the stone-fenced fold at night. Christ's parable about thieves climbing the fence of the sheep's fold at night (John 10:1) and about the Good Shepherd who took all his sheep to the fold but leaves "the ninety-nine" in the fold to seek for the lost one sheep by the end of the day (Luke 15:1-7) were real-life scenarios in Palestine during His time. Shepherds would enfold their sheep by the end of the day in the summer or fall because grass was abundant in the nearby open pasturage. But during the winter or spring time when it was cooler, the grass in the valleys of Bethlehem would be depleted and gone, so shepherds would go farther uplands away for miles to the hills of Bethlehem where grass still thrived and was still untouched and since it was too far for shepherds to enfold their sheep back in their folds in the little town of Bethlehem by the end of the day, they would stay overnight in the uplands to watch their flock from predators. What this topographical and historical data tell us is, it was not normal for shepherds to be out in the open fields watching their flocks in the summer or in the fall because they kept their flocks inside their folds by the end of the day. So Christ could not possibly have been born in the summer or fall because shepherds could not possibly have been watching their flocks at night because they would enfold their sheep by the end of the day during these seasons in Bethlehem. "A little knoll of olive trees surrounding a group of ruins marks the traditional site of the angels' appearance to the shepherds, Migdol Eder, 'the tower of the flock'. But the place where the first 'Gloria in excelsis' was sung was probably further east, where the bare hills of the wilderness begin, and a large tract is claimed by the Bethlehemites as a common pasturage. Here the sheep would be too far off to be led into the town at night; and exposed to the attacks of wild beasts from the eastern ravines, where the wolf and the jackal still prowl, and where of old the yet more formidable lion and bear had their covert, they needed the shepherds' watchful care during the winter and spring months, when alone pasturage is to be found on these bleak uplands." The Bible does not specify that December 25 was the birth date of Jesus, but Jesus' birth in December with shepherds out watching their sheep at night was more real of a scenario than shepherds watching their sheep at night in the summer or fall because during those times, they enfolded their sheep at night. Which means that, basing on Luke's account that shepherds were out watching their sheep at night during the birth of Jesus, and based on understanding the topographical, geographical and cultural milieu in Bethlehem in Jesus' time, the December birth of Christ in Bethlehem scenario was more probable than not. The estimation of the early Christian Fathers that Christ was born in December was therefore more of a possibility than an impossibility. But coming up with an exact date for Christ's birth is biblically untenable because the Bible is simply silent about Christ's birth date although it was possible that Christ was born in December basing on the cultural, topographical and geographical environment in Bethlehem in Jesus' time. Many man-made traditions are bad, but, likewise many man-made traditions are also good. Every culture has good and bad traditions. Celebrating birthdays, for example, is a tradition that may be viewed as good or bad but many Christians celebrate birthdays. Scripture is simply silent about celebrating birthdays. It does not violate any biblical principle or mandate. In Afghanistan, tribes have very strong culture that when a stranger who needs help comes to their house or community, it is the obligation of the people not only to help, and feed that stranger, but likewise, it is their duty to protect him from any possible harm while he is in their custody. They would be willing to die trying to protect that stranger. Of course there are also bad heathen traditions. But the point is, there are good traditions. In the Philippines, for example, younger siblings or younger folks cannot call their older siblings, their parents-in-laws or their older folks by their first names, or address a female "woman," because that would be very disrespectful and insulting. There has to be a respect word like "po," or "kuya" or "manong" or in the case of the parents-in-laws, they have to be called "Ma" (Mom) or "Pa" (Dad). In Christ's time, calling a mother or a female person "woman" was a sign of utmost respect. In the United States, Americans call their older siblings and their parents-in-laws by their first names, a practice that is tantamount to insult and "blasphemy" in the Philippines. So there are good and bad traditions in every culture and a tradition that is bad in one culture may actually be good in another. The Christian tradition of celebrating the birth or Incarnation of Christ is a good tradition because it celebrates the arrival and incarnation of the God of the universe on this earth to save humanity. It was the greatest act of God for the entire humankind that changed the course of man's ultimate destiny which made it possible for mankind to be saved from his default eternal death penalty and to live with God blissfully eternally. Scripture does not prohibit or command the celebration of the birth or Incarnation of Christ. So whether one celebrates Christmas or not, is entirely up to him or her, either way, it is amoral, i.e., there is no biblical divine moral commandment or principle that's violated. It is noteworthy that God Himself adapted to the pagan tradition of "covenant" (berith) as based on the Ancient Neareast Suzerain-Vassal covenant culture when He established His covenant with Israel. God contextualized His truth to Israel by adapting to a pagan tradition that was familiar to the Israelites. So not all pagan traditions are bad, and God does not prohibit something just because the origin of the tradition is pagan, He adapted to it Himself to communicate truth. Technically, this act of God of adapting to human culture is called contextualization or contemporization. His contextualization, however, did not result in syncretization, that is, it did not result in adapting to the evil and false practices of the pagans, instead, God communicated His truth by using a pagan tradition. So Scripture does not prohibit a practice or tradition just because the origin is pagan. If there is no divine moral commandment to celebrate or not celebrate Christmas, hence the practice is amoral, and our only reason to oppose it is because of its pagan origin, then we should probably start banning microphones in churches, cars, church building materials, food products, birthdays, etc. because they originated from the pagan countries. It is an indefensible slippery slope that we are undertaking in the absence of a divine moral command. In fact, the Filipino word "Dios" is a Spanish word that is likewise of pagan origin, it comes from the Greek word Zeus who was the pagan main god of the Greeks (see Acts 14:13 where the anglicized name of the god "Zeus" comes from the original Greek word "Dios"). This does not mean though that we should stop calling God "Dios" in Filipino or in Spanish just because the word has pagan origin. If that is the case, then we should start changing Scripture because one of the most common names by which God is being called, 'Elohim, is also the name of the pagan gods (see Exodus 20:3 where the word "gods" is also 'Elohim in Hebrew which refers to the pagan gods). Some people proffer the idea that Christians should not celebrate Christmas because it is of pagan origin. It is advanced that December 25 was based on the pagan festival called Saturnalia which was accompanied by too much partying and merry-making. However, that pagan festival ran from December 17-23, not December 25. So the idea is blatantly false. Likewise, it was also suggested that December 25 was based on the pagan festival of the Roman sun cult that celebrated the rebirth of the Invincible Sun (Latin, "Sol Invictus"). The historical link between the Christian celebration of Christ's Incarnation on December 25 and the pagan Roman celebration of the rebirth of Sol Invictus, however, is absent. There simply is no direct evidence that shows that Christians copied the dating from the pagan Romans. In fact, as we have already shown above, the primary historical patristic evidence points to the contrary, the pagan Roman Emperor Aurelian who in AD 274 instituted the festivity of Sol Invictus on the same date, December 25, did so to compete with the already extant and popular Christian celebration of the birth of Christ on December 25 because the original festivity of Sol Invictus prior to Emperor Aurelian's decree in AD 274 was actually on August 9 and on August 28. It is obvious, therefore, that Aurelian changed the date to December 25 to copy the Christian celebration of the birth of Christ on December 25. So it was not the Christians that copied from the Pagans, it was the Pagans that copied from the Christians. Already in AD 115-181, Church Father Theophilus, Bishop of Caesarea who lived in the time of Emperor Commodus and within 17 years of the last apostle, and was bishop of Caesarea in Palestine, already testified that Christians celebrated Christ's birth on December 25 (Magdeburgenses, Cent. 2. c. 6. Hospinian, de orign Festorum Chirstianorum). The primary patristic historical evidence therefore establishes the historical fact that the celebration of Christ's birth on December 25 was a Christian original and was not copied from the pagan festivity of Sol Invictus nor from the pagan Saturnalia festivities. Some people also conflate the Christian Christmas celebration with Sunday-keeping. However, Christmas celebration cannot be conflated with the act of the early Christians of changing the Sabbath day to Sunday as God's holy day because the latter was an act that violated and replaced God's apodictic (universal, timeless, unchangeable) Sabbath commandment (God, Christ, the New Testament Christians kept the Sabbath, and in the new heavens and the new earth, the saints will keep the Sabbath, see Genesis 2:1-3; Luke 4:16; Acts 17:2; Hebrews 4:9-11; Isaiah 66:22-23). On the other hand, Christmas celebration does not replace nor violate any of God's commandments. So we cannot associate observing Sunday with celebrating Christmas, they are entirely two different issues and such line of thinking is a non-sequitur, because there is no divine moral commandment against or for celebrating Christmas, while on the other hand, there is an unchanging moral divine command to keep the seventh day Sabbath holy and not Sunday, hence, worshiping on Sunday instead of on the Sabbath day is a blatant violation of God's 4th commandment which says, "Remember the Sabbath day, to keep it holy. Six days you shall labor and do all your work, but the seventh day is the Sabbath of the LORD your God....For in six days the LORD made the heavens and the earth, the sea, and all that is in them, and rested the seventh day. Therefore the LORD blessed the Sabbath and hollowed it" (Exodus 20:8,11, NKJV). God's Sabbath commandment therefore is immutable and unchangeable. It remains for God's people long after the cross (Hebrews 4:9-11) and will continue in the new heavens and the new earth for eternity (Isaiah 66:22-23). Some argue that the cross abolished the Sabbath day, but long after the cross, Paul and the New Testament Christians kept the Sabbath day (Acts 17:2) and the book of Hebrews, written long after the cross, tells us that the seventh day Sabbath remains for God's people, Paul says, "There remains therefore a seventh day Sabbath keeping[Greek, sabbatismos, literally "seventh day Sabbath keeping"] for the people of God. For he who has entered His rest has himself also ceased from his works as God did from His" (Hebrews 4:9-10, literal translation). In the new heavens and the new earth, when sin, death, pain and evil are all obliterated and long gone, all the saved mankind will be Sabbath-keepers for eternity, YHWH Himself says it, "'For as the new heavens and the new earth which I will make shall remain before Me,' says YHWH, 'So shall your descendants and your name remain. And it shall come to pass that from one New Moon to another, and from one Sabbath to another, all flesh [i.e., all of the saved mankind] shall come to worship before Me,' says YHWH" (Isaiah 66:22-23). Christmas and Sunday-keeping are, therefore, entirely two different issues because while there is an eternal divine commandment to keep the Sabbath holy and not Sunday, on the other hand, there is no divine commandment expressed or implied in Scripture that tells us to celebrate or not to celebrate Christ's birth. Copying good traditions that are of pagan origin is not prohibited by God, even God copied a pagan tradition to communicate His covenant with His people. Basing on the topographical, cultural, and geographical environment in Bethlehem during Jesus' time, Christ being born in the summer or fall was unlikely. The likelihood that Christ was born in December is actually high basing on the same cultural and meteorological milieu in Bethlehem during the time of Christ. There is no direct or primary historical evidence that shows that the Christian tradition of celebrating the Incarnation or birth of Christ on December 25, was taken from the pagans. On the contrary, patristic primary historical evidence written before any record of pagans celebrated festivities on December 25, shows that it was the pagan Roman Emperor Aurelian who copied the Christian festivity of the Nativity when he declared in AD 274 that the date of the festivity of Sol Invictus would be changed from August 9 and August 28 to December 25 to compete with the Christian festivity of the Nativity which was already extant more than half a century earlier. The celebration of Christmas on December 25, therefore, is a Christian original. Christians did not copy from the pagans, it's the other way around, it was the pagans who copied the dating of December 25 from the Christians. Likewise the argument that celebration of Christmas is like observing Sunday as a day of rest instead of the Sabbath is a non-sequitur argument. There is no divine moral command against or for celebrating the birth of Christ, in contradistinction, there is an apodictic (timeless, universal, unchangeable) divine moral command to keep the seventh day Sabbath holy, not Sunday. So the two issues are mutually exclusive, there is no moral parallel between them. Finally, whether one celebrates or does not celebrate God the Son's birth on December 25 or any other date, is amoral, there is no such thing as divine moral law for or against such celebration. So there is no reason for anyone who is either for or against Christmas celebration, to be dogmatic or be a fanatic about the issue. For all you know, you may find out after examining the primary evidence, that you are wrong in your assumption that the Christians copied the Christmas celebration from the pagans or that Christ was not born in December. In reality, it's the other way around, primary patristic historical evidence shows that the pagans copied December 25 from the Christians and basing on the cultural, topographical, meteorological and geographical milieu in Bethlehem during the first Advent of Christ, the likelihood that Christ was born in December is very high. Christmas is just around the corner, if you celebrate the coming of God to this world to be one with us as a human being to live an absolutely perfect life as a Man in our behalf, and to vicariously die our eternal death penalty for our sins so that by faith in Him mankind may have eternal life, go ahead, celebrate it! It is the most wonderful thing that ever happened in man's universe and history that changed the ultimate destiny of mankind from eternal death to eternal life with God because of the incarnation of our God and Savior Jesus Christ (Titus 2:13; 2Peter 1:1; Isa. 9:6). Merry Christmas!